Before this blog even starts, I need to thank Ivan Samuels for sharing his bandwidth on his MiFi with us -- Wayne had a teleconference this morning at 2 am, and I couldn’t upload the blog on the ship’s connection. Ivan gave us access to some high speed bandwidth, and we were both successful. Without Ivan, no blog. Thank you!!!! While we really enjoyed Amsterdam, it was time to get on board a boat and head towards Germany. I do still swear there was a ghost in the room, as none of the problems that plagued me the previous two nights happened at all. In fact, I slept until 6:30 am. There’s something about being on a boat that is soothing. 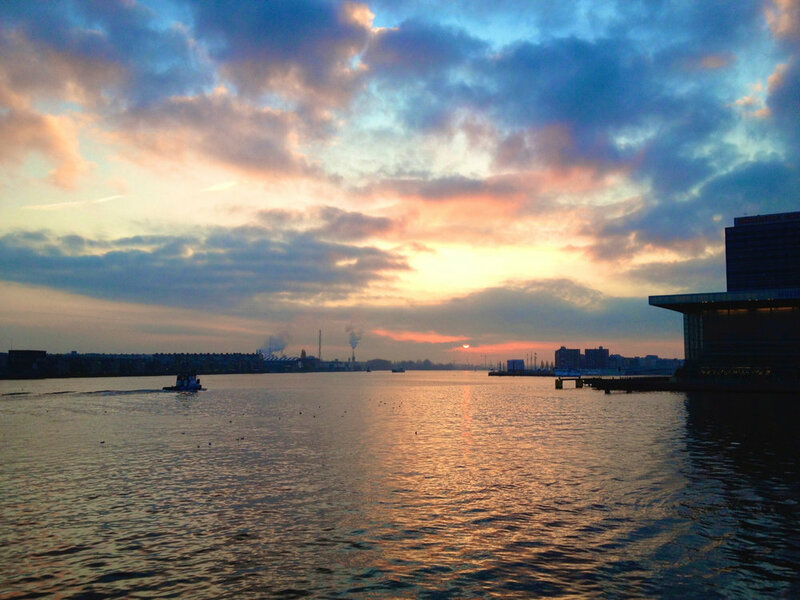 This morning, at 8:00 sharp, we cast lines from our tender and headed towards the Amsterdam-Rhine River Canal. During the process, we went through several locks. Based upon the view from our stateroom window, you get pretty darn close to the side of the lock. The process itself is pretty amazing, you enter the lock if there is a green light. Sometimes you wait for several boats to get in with you before the rear lock closes. As it closes, you are lowered in the water so that the top of your boat will make it under the lock. Then a green light goes on at the forward lock, it raises, and the boats are slowly allowed to proceed. We wound up going through two locks today on our way to the Rhine, and made it into Germany somewhere near the 6:00 hour. Since we were at sea for the entire day, it was (theoretically) filled with Mac classes. There were two classes on digital photography today. One was the basics, nice review, and the other got into the more technical aspects like depth of field, exposure, aperture settings, focal length, and light metering. Chris Marquardt, who hosts the Photography Tips From the Top Floor podcast, was our speaker. I got to practice my German with him, and felt my confidence raising quite a bit! The second session (Chris’ second session was actually session number 4) was with Josimar King, who led a discussion on the migration from MobileMe to iCloud, which was quite lively. Our third lecture should have been on the basics of the iPad, but we (who paid) were turned away because too many who had NOT paid were let in. But that’s another story. The final session of the day belonged to Dr. Wally Cherwinski, a great human being, and he went over the basics of video, how to get started, tools to use, and habits to develop. We had been part of this on our last cruise, so Wayne took a nap, I went to the excursion briefing for tomorrow, and then I crashed for about 40 minutes before dinner time. Now for the disappointments of the day. They center around the InSight Cruises staff. As I mentioned before, Wayne and I (along with several others) wound up unable to get into the second session. We were turned away because the room was filled with people who had not signed up for the MacMania conference. And, to add insult to injury, the conference coordinator, while looking at my badge, asked if we had signed up for the session. I didn’t shout out the obvious, “We paid for this session,” I just showed him my badge. They ran to get another two chairs, but we would have been smashed against a wall and very, very uncomfortable. We are sharing the ship with Bright Horizons, a group of scientists, and a large number of them came to the iPad session because InSight determined that it would be fine for all of us to move between sessions. Unfortunately, Bright Horizons comprises 2/3 of the participants, and MacMania 1/3. They have the very large forward lounge for their sessions, and we have the aft lounge, which only seats 38, for our sessions. The MM participants alone are greater than that number. Starting with the first session of the day, and continuing through the entire day, there were not enough seats set up, and extras needed to be brought in for all of us to be seated, making the room very cramped. We are also seated over the engines, which are not quiet, and the noise echoed through the room. Very distracting. As was the noise and the light from the workout room, which juts into the lounge. All in all, extremely unpleasant conditions. It is extremely obvious that the InSight staff did absolutely no pre-trip coordination or testing. I realize that it is expensive to send someone ahead to do this kind of work, but the overall quality of this conference has diminished, and we are not happy. I sent a note to the CEO of InSight tonight (had it proofread for accuracy and lack of snarkiness) expressing my displeasure. Thank goodness for the company of friends, the crew, the boat, and the fact that I am back in Germany for the first time since 1999. If not for them, I’d want to be home right now. Tomorrow we are off to Koln (needs and umlaut, aka Cologne), where we will spend all morning, and then to Koblenz, where we will have a night time walking tour of the city, and be given some free time the next morning. I am looking forward to this, as I have never been to either city! The InSight staff here has said they will be addressing issues tomorrow, I will hold out some hope, but I have been less than impressed with them this trip. Gute Nacht, schlafen alle fest.